“The Way of the Hoop” Necklace. $825. Our peoples call it by various names: the path, going well through life, the Good Red Road — different means of describing the way of the hoop. It’s the way of our ancestors, given to us by the spirits, a sacred path that, if walked carefully, with a good heart and a strong spirit, will grant us a life of harmony and balance. Wings gives form and shape to the journey, and to our own very personal stake in traveling it, with this necklace, a pendant wrought in the shape of a hand, overlaid front and back with hand-made coils of fiery copper. 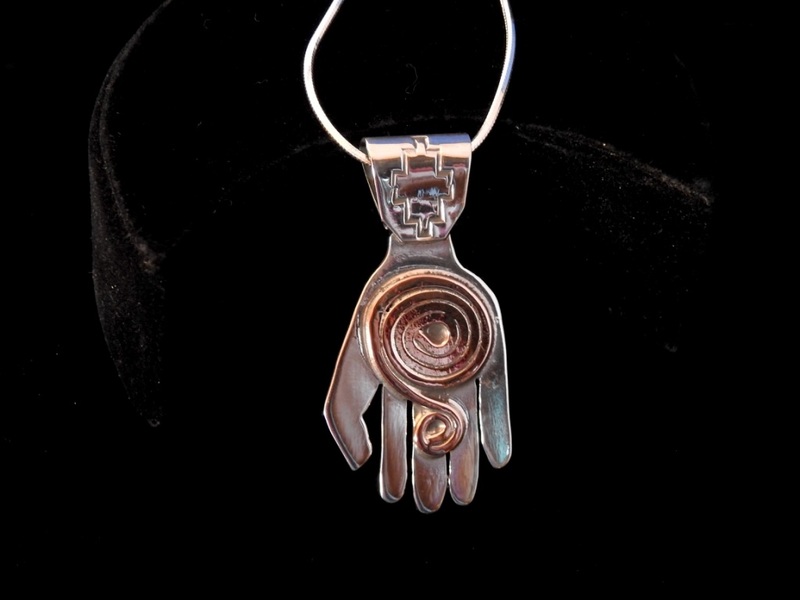 The pendant is cut freehand of solid sterling silver, thumb and fingers articulated clearly and expressively. On the front, a dual coil formed of a slender length of warm glowing copper is soldered securely into place, the large coil over the palm and the smaller one extending atop the fingers. On the reverse is a second, smaller pair of coils both wound and aimed in the opposite direction, the larger one over the back of the hand and the smaller one extending upward toward the wrist. 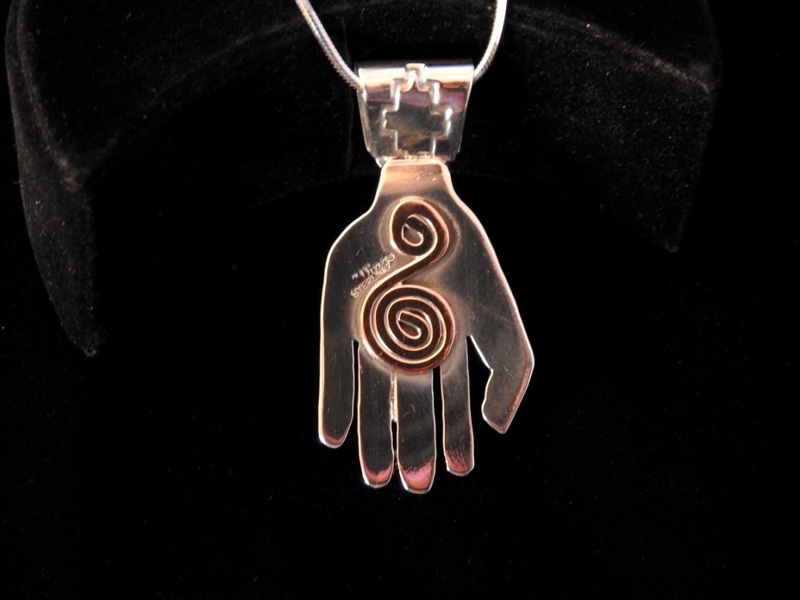 The hand itself hangs from a hand-made sterling silver bail, lightly flared and hand-stamped in a repeating pattern of conjoined thunderhead motifs, creating a symbol that points to the Sacred Directions. The pendant is suspended from a shimmering chain of solid sterling silver. The pendant, including the bail, is 1-1/8″ long by 1-1/16″ across at the widest point; the bail itself is 1/2″ long by a 1/2″ across at the widest point; the chain is 20″ long (dimensions approximate). Reverse shown below. Posted on Wednesday, December 19th, 2018 at 12:00 pm. Filed under: Necklaces	RSS 2.0 feed.